Yep. The Baptist Messenger “” an established weekly newspaper with a paid circulation of over 85,000″”decided to photoshop Governor Henry’s signature on the embarrassing and archaic “Proclamation for Morality.” And to try and make the piece of right wing trash look even more legitimate, they placed the text of proclamation onto Executive Department letterhead and forged the signature of Secretary of State M. Susan Savage next to the state seal of Oklahoma. Yeah, this is scandalous. And yeah, this is wrong. But know how it makes me feel? It makes me wish I was Baptist. These people can get away with anything! They can forge our Governor’s signature to a document, buy influence key elections and even hijack every Braum’s in the state on Wednesday nights. It’s just too much power for one group to have, and I want a part of it. Seriously, think of all the fun we could have if we were Southern Baptists. We’d be unstoppable! Sadly, though, that’s probably a pipe dream. We like hot chicks, are logical, and believe in equal rights for everyone, so they probably wouldn’t have us. All that being said, I think it would be a good idea for the Baptist Messenger to issue a forgery retraction in their next issue. Along with it, they should also apologize to Governor Henry for attributing him to a document that was written and endorsed by a right wing religious nut job bigot. And for fun, forge Sally Kern’s signature to it. UPDATE: The Baptist Messenger has issued an apology on their website. According to media report, they placed the blame on a graphic artist. Classy. UPDATE II: Every local news outlet is now covering this story. Granted, they are not thanking us for breaking it, but who really cares. Here’s hoping this story gets picked up by some other news organizations. Are you sure that it wasn’t just a “here is hoping” or were they actually trying to say the governor signed it? Is anyone really surprised by this? The morality police (i.e. the Bible-thumping, gay-bashing, gun-toting right-wing crazies) are ALWAYS the first to many any and all moral transgressions and justify it with some obscure passage from the Bible. I guess Exodus 20:16 isn’t in their Bible. We do have forgery laws in this state, right? Paging Mr. Edmondson. As if denigrating the Oklahoma Constitution by having the rally and signing on state property weren’t enough, then someone goes and does this! Where are the morally outraged Republicans trying to distance themselves from these nutballs? Oh wait, the Republicans in this state depend on these folks playing to the lowest common denominator in order to keep sending them to the Capitol. if you are going to make stuff up, at least get some signatures that would make sense. i’d have Jesus’s signature on that thing. or you could cancel out their pissyness by just faking Obama’s signature on there. With morals and standards like this, they all need to move into the C-Street house at once! Tom Coburn and John Ensign are awaiting their arrival! 1) I doubt that any readers of the Baptist Messenger are under the impression Governor Henry signed that. Given the accompanying editorials, one would assume that the BM is implying that he and Susan Savage should sign it. 3) Does Patrick get to attack what he perceives to be the moral failings of others (right wing religious nut job bigots) because he does not subscribe to an identifiable personal moral standard? Or because he’s just an obscure local social blogger? I love reading the “moral outrage” of someone who publicly objectifies women on a regular basis. 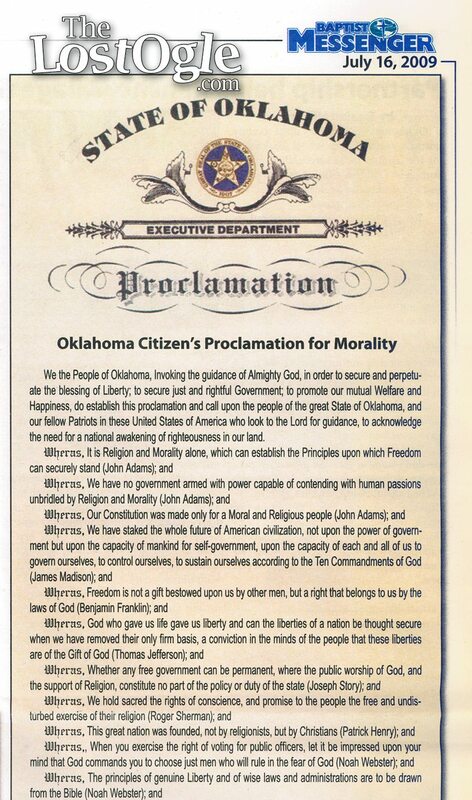 In the July 16 Messenger, the graphic representation of the Oklahoma Citizen’s Proclamation for Morality was misleading, indicating that Oklahoma Gov. Brad Henry and Secretary of State Susan Savage had signed the document. This is not the case, and the Messenger staff apologizes for the oversight and error. I think you’d be surprised, Dusty. If a buch of BM readers don’t say things like, “Sally’s proclamation couldn’t have been that controversial if a heathen like Brad Henry would sign it,” I would be shocked. We’re talking about a denomination that basically creates the need for Snopes.com. 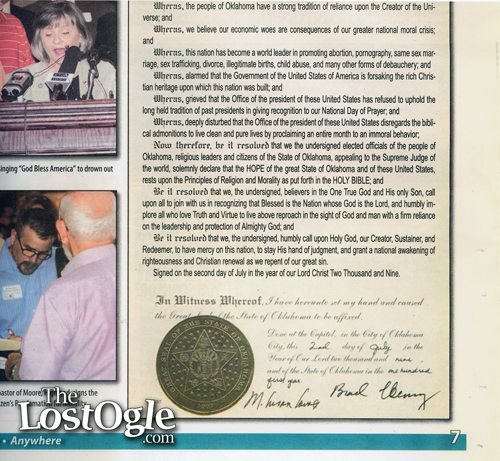 How can it be an “oversight” when someone actively went out of their way to find copies of the signatures and photoshop them into the picture before printing? Typical right wing ideology. Deception and dishonesty is wrong, unless it supports their cause. Then its okay because thats what Jesus would want. Give me a break.